The evidence below was either destroyed by the police and prosecution or conveniently went missing in the Meredith Kercher murder investigation. The clasp went from looking like this on November 2 and December 18, 2007. On the left: The clasp on November 2, 2007. On the right: The clasp on December 18, 2007. To this in Patrizia Stefanoni’s report. Notice the cloth is now a dirty red color. To then looking like this when the independent experts got it during the 2011 Hellmann Appeal. Profs Carla Vecchiotti and Stefano Conti noted in their report the clasp had been stored in extraction buffer and the hooks rusted away. In other words, this key piece of evidence had been destroyed making further testing or retesting impossible. The November 6, 2007 search warrant above lists the items seized from the cottage. #2 is an Exilim camera belonging to Amanda. It’s a Casio brand which most likely looks similar to the 2007 model below. The camera went “missing” after it was seized and along with it a video of Amanda and Meredith having a good time at the Euro Chocolate Festival. Amanda’s Toshiba laptop. The image is from page 12 of the computer consultants report dated March 31, 2008. 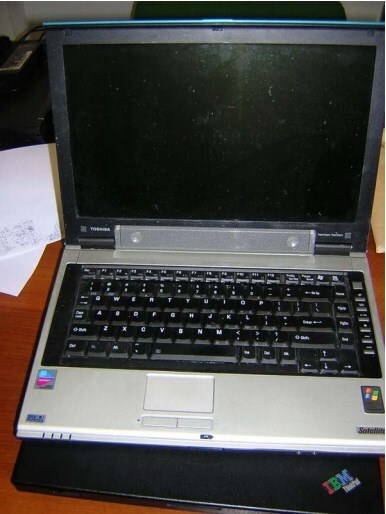 Following the tests carried out, by various interveners, it therefore appears that the Toshiba disk belonging to Miss A Knox’s Toshiba-brand laptop was damaged with problems evident in the electronic board, which resulted as being inactive, just like the other two. While the contents of two of the three disks have been recovered, following the Krollontrak company’s diagnosis, the third disk seems to have been also damaged in its component mechanics, while CBL Data’s and Recovery Tech’s diagnoses confirm that the third disk has been damaged in its electronic component. In reality, the damaged component is the electronic board, where an integrated circuit sits, sometimes referred to as “BIOS”, containing the binary code that allows access to the data, calibration, writing and reading. This technical specification belongs to the Toshiba manufacturing house, a proprietary [page] technology. The electronic board and the binary data contents of the disk being inextricably linked and intertwined, and the Toshiba logic board being damaged, it has therefore been impossible to recover it. Only a possible intervention by the parent company or its licentiate, by means of supplying the binary/BIOS code, would be able to justify a further intervention. It is however truly incomprehensible that three hard drive units, differing among themselves as to capacity, produced by among the most quoted manufacturers, belonging to and operating on three different laptops, could all three end up damaged in a similar manner and all three react in the same manner to an attempt at reading the data by an external disk controller run by the Operating System residing on an IBM PC furnished by the IAC/CNR Institute and of relative utility for data recovery. The bloody footprints later identified as belonging to Rudy Guede were wiped clean off the floor less than 12 hours into the investigation on November 3, 2007. A protective casing should have been placed over them, followed by examination by a footprint expert and then the tiles removed and taken into evidence. When the CSI returned on December 18, they had to use photographs to try and locate where they were. CSI wiping the footprints clean off the floor on November 3, 2007. CSI trying to find Rudy Guede’s shoeprints on December 18, 2007. Image is page 6 from Professor Vinci’s shoeprint analysis. We emphasize, moreover, that — as shown photographically — multiple components of dark-red color were present, scattered throughout the inside of the tube, both at the bottom and near the closing top. One of the clasps was recognizable in its original form, with the characteristic square upon which the corresponding round-edged hook is sewn; the other no longer had any kind of shape, as it was so completely deformed as to have been inserted into the first [clasp], with which it was partially fused due to the presence of rust; separation of the two elements would involve the fragmentation of certain rusted components.